Saying “thank you” might come off as a simple gesture, but you’d be surprised by how quickly it can change the course of the conversation. We often use this phrase to show gratitude and when you say it to someone being inappropriate, it can show them that you’re not angry. Rude people find it amusing when others get angry and return their impoliteness to them, as this reinforces their negative behavior. If you hold your tongue and remain civil, it means that you recognize the person’s rudeness, but have chosen not to let their bad behavior affect you. Most people find it hard to accept someone else’s opinions. If there happens to be even just a little truth in what the person is saying, then use this phrase to stop the person in their tracks. Ultimately the conversation shall be cut short and there will be less chance for it to develop into a heated argument. If you really want to get through to the person, you might need to explain to them that they are hurting your feelings. Sometimes this is the only way to let them know that their words are indeed rude and causing others harm. In some cases, those people are just too insensitive and are not aware of how their words are affecting others. They may think that their words are humorous, and this kind of behavior may have been acceptable to some of their more unrefined friends. So if you speak up, they may be able to correct their inappropriate behavior and apologize. Unfortunately, rude individuals don’t always care who they are offending. If you make it clear to them that you’ve been hurt or offended, and it still doesn’t stop them, this phrase will. This signals to them that you no longer enjoy the conversation and that you won’t put up with their ill-mannered behavior. Hopefully, the person will think twice before saying something rude the next time around. Psychologists have often recommended that one of the main ways to stop someone who is criticizing another, is to label their behavior as negative and not okay. Another useful phrase would be, “Stop being rude to me/Stop criticizing me.” These phrases point out the negative behavior of the other, and instantly disarms them. 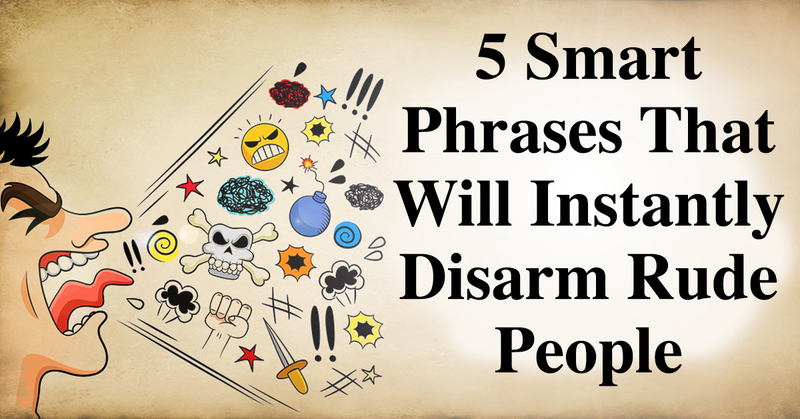 These phrases can also help the other person re-evaluate their attitude and really think about their words. By putting the spotlight on their actions, you are highlighting their negative behavior and this may help them be careful with their words in the future. While our goal is to get along with others through the use of kindness and compassion, tolerating emotional abuse and harmful negativity neither helps us nor the other person. Setting boundaries of love and disarming rude behavior is actually an act of love when it promotes maintaining the love within yourself, and it sets a good example for the other person to become more loving. Next articleWhat Does Your Zodiac Reveal About Your Thoughts?